Terra, I have an unmodified M17, it was originally mounted on my 22-inch Dob as a finder. I believe the Apogee scope objectives are f/5 or close to it, about the same f/ratio as the stock M17- what the prism train was designed for. None of mine appear to have the thoriated glass. I believe the "SAO" on the plate is for Smithsonian Astrophysical Observatory. Nice! I was watching those and decided not to bid at the last minute since I don't have room for more scopes. Glad to see somebody here got them and knows how to fix them up. 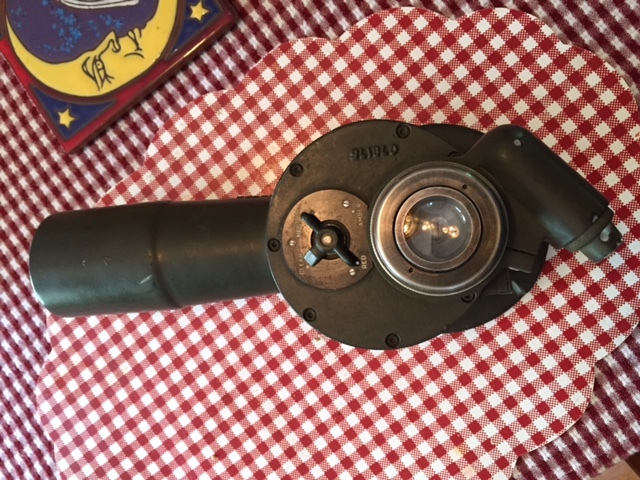 What's cool is that the Apogee scopes were purpose-made (modified) expressly for Moonwatch. I had always thought they were an off-the-shelf, standard military telescope that had been co-opted for Moonwatch- but that's not the case at all. They would not exist in the 120mm aperture had it not been for the satellite spotting program. It is definitely a cool scope Chuck. What are you going to put it on? It would be cool on a vintage alt-az mount and tripod like the old american-made Professional Juniors. Many of those were sourced for the US govt. I have one that I use my RFTs- a 120mm F5 refractor and my 6" F4.5 Newt. They have a nice detachable pan handle, the legs can extend to 6' and are very sturdy. They were made by the Camera Equipment Co. of NYC starting in 1941. They were used extensively by military photographers and film makers from WWII on through the Vietnam War years with essentially no change. One would be perfect for your Apogee Scope. Edited by terraclarke, 16 July 2015 - 07:23 PM. Mounting it will take some thought, Terra. It's so front-heavy that standard mounting methods won't work. The flat mounting base under the eyepiece is so far from the balance point that it will probably have to be attached to a long, stiff plate that extends forward nearly to the objective. Being a refractor, the eyepiece needs some elevation on whatever the final mount configuration turns out to be. We'll see. I am sure you would love it on a smooth pan-head alt-az Chuck. The idea of putting a long mounting plate on it is a great one. Then you could find the balance point and just drill and tap a 1/4-20 hole. Use a piece of aluminum plate stock, 1/4 or 3/8" thick and 2 to 3" wide. 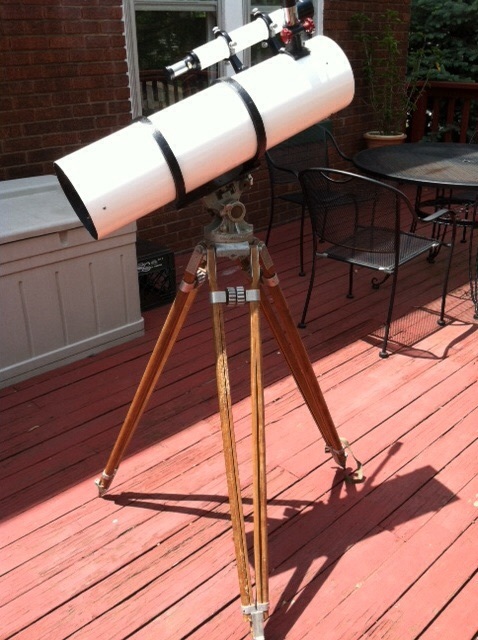 It actually would be terrific on my "Weightless" mount, which uses Dobsonian kinematics & technology for refractors. I've got lots of aluminum plate stock kicking-around. At 20X, no drive will be required. When these telescopes were being used in project Moonwatch, they were clamped-down to the particular spot they were assigned-to, and didn't move. That would have been torture for me, especially if a nice object were just at the edge of the FOV. I would have wanted to do some sweeping with that thing. I imagine having a degree of ADD would have disqualified me as a moonwatch candidate. Lol,get sidetracked from my own observing goals all the tine. It's pretty cool in the rocker-box in the photo in that first link you posted. 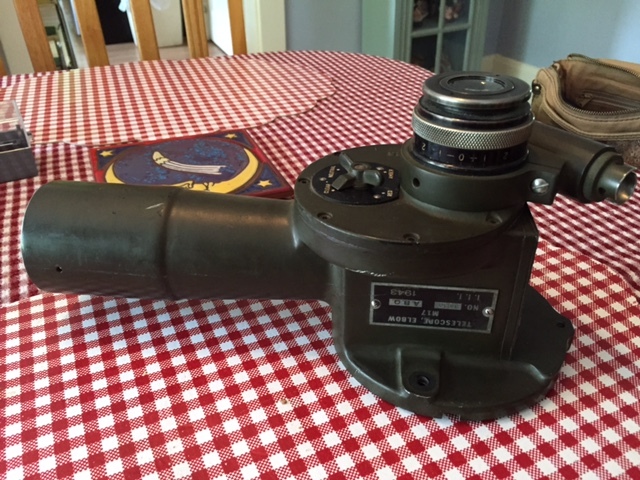 I just bought the baby (a 1943 7x50mm M17) for 45 bucks and it looks to be in excellent condition. I always thought they were cool in the old Edmund catalogs. I thought it would be fun to have one and it has the big old Erfle eyepiece that in and of itself was worth the cost. And it will be rugged enough for the grandkids. It should be here Tuesday. I'll out it on my vintage Professional Jr. tripod (pictured above). Edited by terraclarke, 17 July 2015 - 11:54 AM. My unmodified M17 has a home-made power supply for the reticle illuminator, built by my friend, Brent Watson. You may be surprised how heavy even the stock version is, Terra. They were built to withstand the rigors of combat conditions, and are no lightweights. Hopefully the diopter focusing mechanism turns smoothly. Some of these are awfully stiff and you need to work at them a bit to loosen up and smooth out. Congrats, post pics when you get it. And I'm curious as to your opinion of it optically, used on the stars. I will Chuck. I remember seeing and handling one years back. It seemed quite heavy and bulky. I figure if they can "withstand the rigors of combat" this one should withstand the rigors of my grandson's usage. I figured I couldn't go wrong for the price. And it was only $7.50 to ship! It looks quite nice. And I wanted it more as memorabilia of 1950s and 60s amateur astronomy than anything else. I will post pics when it gets here. I had some fun with it mounted to an old wooden bar stool. Watched a few iridium flares with it. Tracked the ISS & HST several times. Some very wonderful images and info about these scopes. Thanks everyone. I've got that same model Observer, Richard, it's a terrific satellite scope. Yes they are the same model. I agree they are a fantastic little scope plus I like to think they are quite a nice piece of history. When I saw your images I knew I needed to post a link to my scope from 2009. BTW, I looked up my old emails from eBay and found I paid $49.99 + shipping ($15.00). It does have a bit of weight to it too. Well, it's not a Satellite scope but I could make it into one and it is a classic. Besides, I always wanted one of these and this one is in very nice condition. (2) the diopter ring is frozen and will not turn except to unthread and remove the eyepiece. Shouldn't the eyepiece move up and down like binoculars when I twist the knurled ring? Edited by terraclarke, 21 July 2015 - 12:21 PM. 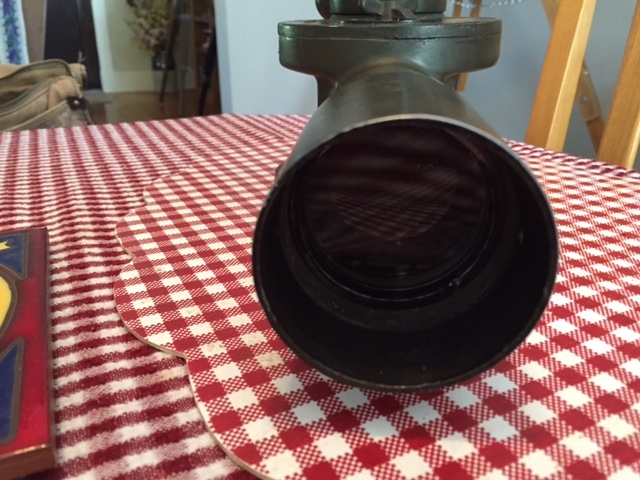 The objective lens is cemented and uncoated. It is nice and clean. Free from any fungus, scuffs, or scratches. The eyepiece is similarly very clean and clear. It is not thoriated glass- no yellowing, and it is smaller and lighter than I would expect if it were an erfle; I believe it is a kellner. Edited by terraclarke, 21 July 2015 - 12:28 PM. I warned you that some of these focusing mechanisms (diopter adjustment ring, they are all supposed to be used at an effective infinity focus) are tight or frozen-up. I believe that the outer retaining ring will only free up the eye lens assembly, it might not grant you access to the focal plane, where the reticle is located. The entire eyepiece should unscrew at the base. On some of these, there are two grub screws that keep it from unthreading, until the screws are removed. You will probably have to remove the reticle illuminator collar to access them, if your model has them. I'll check mine when I get home from work tonight and let you know if I can shed any light on eyepiece removal. Hi Chuck. Thanks. 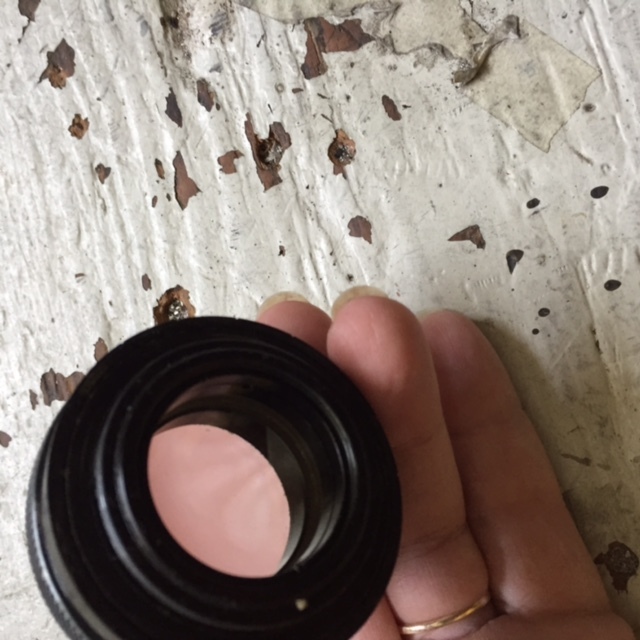 The eyepiece assembly easily unscrews and comes off, but the retaining ring that hilds the reticle is quite tight and will require a real spanner to unscrew, not just a jeweler's screwdriver in one of the two slots (my usual method). As far as the eyepiece itself, when I turn the knurled knob, the entire assembly unscrews. Shouldn't it turn independently of the eyepiece and cause the eyepiece to go back and forth like binoculars to allow focusing? I fear that part is frozen up. The illuminator assembly also comes off easily. The filters work great and are nice and clear like the rest of the optics. I am going to make a triangular aluminum mounting plate out of 1/4" thick stock to attach to the three outer mounting holes in the base, and dril and tap a 1/4-20 mounting hole in the center of the plate for tripod attachment. Edited by terraclarke, 22 July 2015 - 07:07 AM. I'll have to check mine when I get home tonight, Terra, I'm at the office for another seven hours or so. But I seem to recall that the eyepiece does turn, only the reticle stays stationary. I'll report what I find tonight. I'll check both Apogee scopes as well as my unmodified M17. Hi Chuck. Here you can see mine with the eyepiece unscrewed. 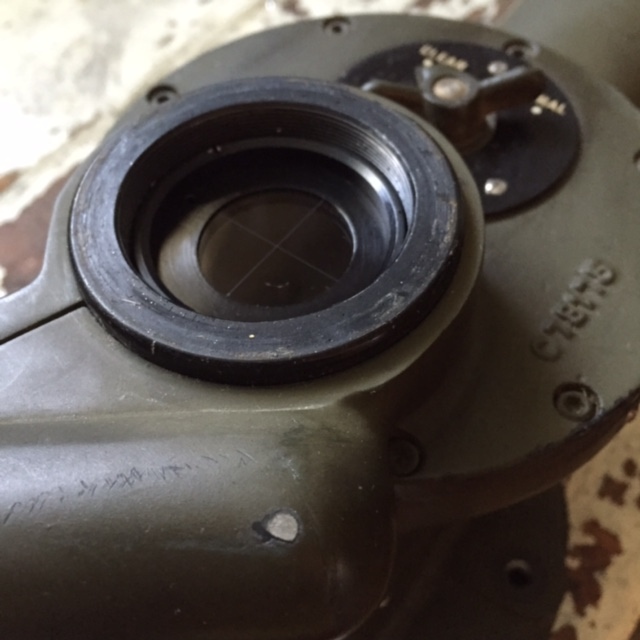 You can see that the reticle lies beneath the eyepiece and remains stationary when the eyepiece turns.